Donald Trump made an ultimate promise that should sound very familiar to American citizens, as many incoming presidents (including Obama and both Bushes) have made some similar plans and proclamations. Like all plans, to bring this one to fruition will require a tremendous investment of resources: in people, in equipment and facilities, in research and development, and in terms of money as well. With no plans for adequate, additional funding to support these ambitions, these dreams will simply evaporate, as they have so many times before. As a percentage of the federal budget, investment in NASA is at a 58 year low; at only 0.4% of the budget, you have to go back to 1959 to find a year where we invested a smaller percentage in our nation's space agency. If you look at the percent of the federal budget currently being invested in NASA, you'll find that you have to go all the way back to 1959, the first full year of NASA's existence, to encounter a time where we invested less in the agency than we do today. When we chose to go to the Moon, it was accompanied by a tremendous increase in the resources we devoted to the endeavor: up to nearly 5% of the federal budget. Today, that figure sits at just 0.4% of the budget (0.11% of our GDP), or less than one-tenth of what we invested in NASA the last time we sent humans to the Moon. The International Space Station has been a tremendous environment for studying the effects of microgravity on a variety of systems, but very little in the way of exploration and discovery has taken place aboard it. NASA's crewed spaceflight missions since the end of Apollo have focused on low-Earth orbit. But if the goal is to explore the Universe, and to take humanity deeper and farther into the cosmic sea than we've ever gone, a return to the Moon won't accomplish that. The vision of the Trump administration, laid out earlier this year, involves a shocking proposal, to build a lunar space station orbiting the Moon. In no way, shape, or form does a lunar space station prepare us or aid us in going to either the Moon or Mars. Instead, it's a project that merely serves to: provide a use for the Space Launch System (SLS) that's already developed, provide a potential application of the Orion capsule system, and provide potential partnership opportunities with Russia on an orbiter and Europe/Japan on the habitation modules. 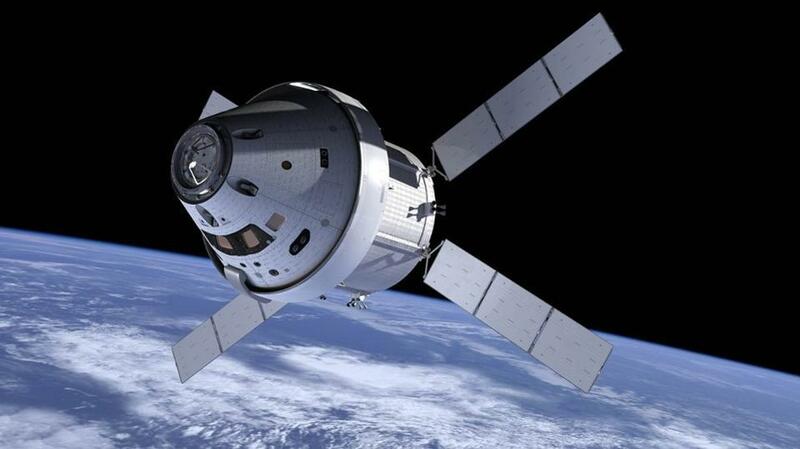 The Orion capsule would be one of many components on a proposed space station that orbited the Moon, but the scientific and technological payoff would be extraordinarily low. It's a proposal that should make you furious. If you want to go to the Moon, you design a system to put humans on the Moon. If you want to go to a different world, you design a system to put human beings on that world. If you want to go to deep space, you figure out what you need to go to deep space — and you go. Instead, the plan will spend a great deal of money without yielding appreciable results. If you want to accomplish something great, you don't look at the technology you've already developed and ask, "What can we do with it?" Instead, you must look at the goal you want to achieve and ask, "what will it take to accomplish this?" You also have to provide funding for it, and plan it on a realistically short timescale. Throughout history, any grand plans in space taking more than 10 years have not come to fruition. There is no reason to believe the current 'stepping stone to Mars' plan, laid out earlier this year, is any different. If the goal is to go to Mars, we've already done extensive research into how much it would cost and what type of technological development it would require. To do it safely and responsibly, it would take a sustained investment totaling somewhere in the ballpark of $50-$150 billion, spread out over the course of approximately 10 years. The plan would involve landing a slew of equipment on the Martian surface, along with robots and rovers designed to self-assemble stations and habitats, and then a crew of human beings, who would stay for anywhere from 6 to 18 months before returning home. The largest and heaviest things ever landed on the Martian surface are far lighter than what a crewed mission would require, and the only way you ensure the safety of the crew on such an endeavor is through practice. Mars, along with its thin atmosphere, as photographed from the Viking orbiter in the 1970s. Even with the difficulties associated with living on the Red Planet, a successful human colony could be achieved for as little as $50 billion. When we decided to first go to the Moon in 1961, this was the vision and the rationale laid bare before the American people: There is no strife, no prejudice, and no national conflict in outer space as yet. Its hazards are hostile to us all. Its conquest deserves the best of all mankind, and its opportunity for peaceful cooperation many never come again. But why, some say, the moon? Why choose this as our goal? And they may well ask why the highest mountain climb? Why, 35 years ago, fly the Atlantic? Why does Rice play Texas? It has now been more than 45 years since humans have set foot on another world. The proposed crewed lunar orbiter would not accomplish even that feat again. The spinoff technologies alone have benefitted American society in far more ways than giving us teflon and a space pen; advances in cooling suits, kidney dialysis, physical therapy, athletic shoes, home insulation, water filtration, freeze drying, pipeline protection, gear for firefighters, and so much more have come about directly from the Apollo program on its own. No one can promise what the returns will look like on a mission to Mars, but there are two things we can be certain about. Going back to the Moon won't get us any closer to Mars. If we want to go to Mars, we should make that our goal and invest in it; if we want to go to the Moon, we should make that our goal and invest in it. Pretending that one has anything to do with the other is a delusion. Unless we increase our funding to achieve whatever goal we set our sights on, we'll continue to have our crewed spaceflight program stagnate, while China, India, Japan, Russia, and more all continue to grow theirs. America is home to some of the greatest scientists, engineers, astronauts, administrators, and organizations in the entire world. With the people and facilities we have today, we could put a human on the Moon or even on Mars within the next 10 years, if only we invest in it. But grandstanding, lofty promises, and a dearth of funding will yield the same results they always have: a nation whose greatest dreams go unfulfilled. What we can accomplish as a species is limited only by what's physically possible and what we invest in it. Our ambitions to venture beyond low-Earth orbit are achievable, but only if we make it so. Unless there's a plan to increase NASA's funding to sufficient levels to send humans to worlds beyond our own, America is never going to get there. This article was initially published on Forbes. You can read the article here.